I just checked the notebook I keep with my tying gear, in which I write down the flies I've tied, when I've tied them, and in what sizes I tied them. The last entry in the notebook was two years ago. No wonder a couple of my favorite beadheads and nymphs are completely missing from my boxes... I must have run out! 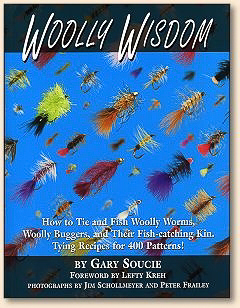 But what got me thinking about setting up the vise again is the very simple "clipped woolly worm" pattern Fred Bridge tied for me and which I featured in a post here on the blog in March and which become another "fly with a story" on the Web site. The simple fly is called a Wonder Bug. I checked out my copy of Gary Soucie's book, Woolly Wisdom, and found quite a number of clipped hackle woollys. And I felt the urge to do some tying. In particular I picked out the Henry's Lake Special on page 53. It's basically a peacock herl woolly worm with two brown biots for a tail (stonefly nymph?) and clipped brown hackle. However, I think I will tie it with black biots and clipped grizzly hackle. I certainly can appreciate well-tied and difficult-to-tie flies. They are usually works of art. But for me, I really like simple flies. This is perhaps why I will never be an "expert" tier. I am happy to tie and fish the easy flies. In fact, I am always thrilled when I catch fish on a fly that was made from only one or two materials. The Henry's Lake Special is right up my alley. But step one was to set up my stuff, which I did this evening before catching up with my wife to watch some baseball on TV. 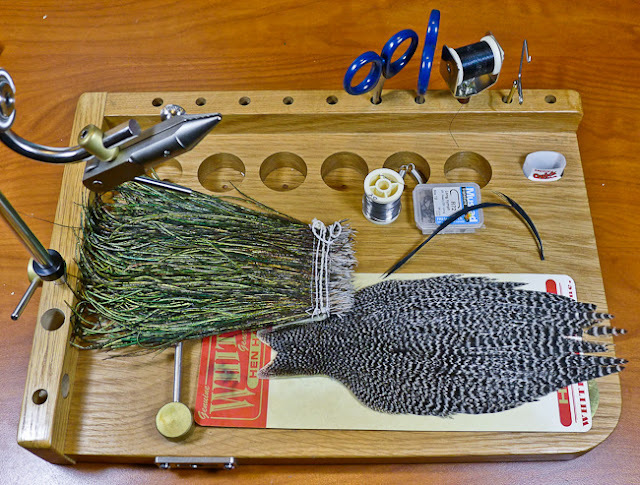 I took the peacock herl and grizzly hackle and biots out of the Sterilite box labeled "feathers". I set up my J-Vice and put a couple of tools into its oak base. My brain was a bit groggy as I tried to remember what was needed. Let's see: scissors, whip finish tool, thread and bobbin. Oh, in addition to the feathers, I would need lead wire and hooks. I think that should do the trick. Oh, and magnifiers! So, here's my set up. 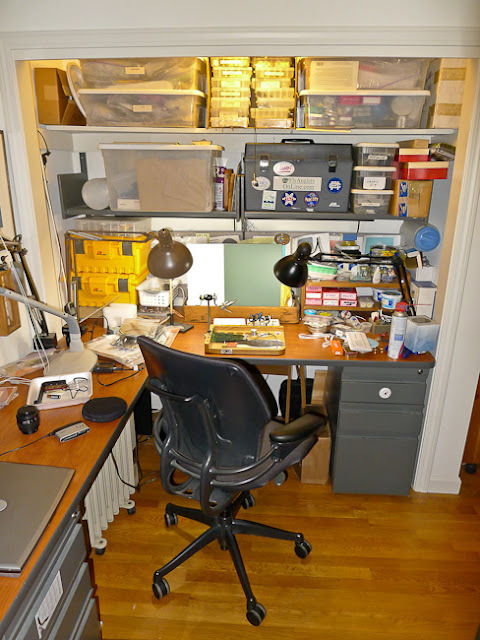 I have an L-shaped desk with the tying table actually inside a closet. Overall, this gives me a very nice little office inside an extra bedroom. This is as neat and clean as it will ever get. Remember, I haven't started tying yet *LOL*. I've got all my materials and I am ready to go! The hooks are size 10 Mustad Signature R72s. And I like hackling my small woolly worms with Whiting hen neck hackle.